Nordin (second left) with a rat during the City Hall’s “Operation To Eliminate Rats” at Bandaran Berjaya yesterday. KOTA KINABALU: A total of 564 anti-littering summonses have been issued by the City Hall since its introduction in 2016. City Hall director-general Datuk Amrullah Kamal said 26 of these offenders ended up in prison, as they were IMM13 holders (non-citizens). He said 422 offenders out of 564 were ordered to perform community service as punishment. “Those who were imprisoned were foreigners caught littering in public places. They were sentenced after being brought to court. 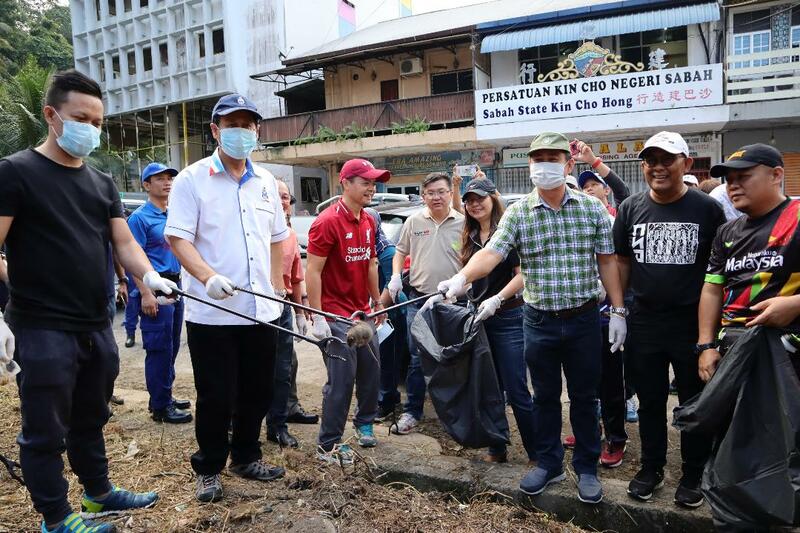 As for local citizens, they would be slapped with a RM10,000 fine or perform community service for 40 hours, Amrullah told reporters when met at City Hall’s “Operation To Eliminate Rats” at Bandaran Berjaya yesterday. In light of the operation, he reminded all of the food premises in the city centre to always be responsible when it comes to cleanliness. “All premises must work together with City Hall to maintain cleanliness and to prevent the spread of rats,” he added. He explained that the operation would be conducted regularly and that any food premises that fail to abide by the law may face immediate closure. “Food waste must be packed and disposed off accordingly to prevent rats and stray dogs from coming near it,” he said. Yesterday’s operation was led by newly- appointed mayor Datuk Nordin Siman, with support from the N.15 Api-Api Office. Some 1,000 people took part in the operation, which was aimed at spreading awareness on the importance of food waste management in curbing the breeding of rats in the city. Among the activities held during the operation were cleaning the drains and inspection of food premises. Last December, former mayor Datuk Yeo Boon Hai led the same operation at Segama. Also present was N.15 Api-Api Community Development Leader (PPM) Grace Lee, who represented her assemblywoman Datuk Christina Liew.